A rather recent discovery in Northern Michigan has left archeologist scratching their heads. In the Thunder Bay region of Michigan, more specifically Alpena, hundreds of ancient shale disks have been unearthed. 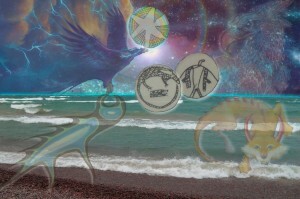 The sacred disks contain images and symbols ranging from Thunderbirds, Water-Panthers, Stars, and even Medicine Trees. The majority of the disks contain spiritual or cosmic symbolism. 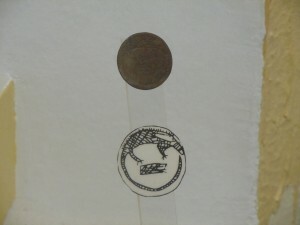 As often happens, when the disks were initially discovered archeologist declared them a forgery, even possible a hoax. Before discussing the authenticity of this lost treasure, first let us set the scene for the original discovery. The Region of Thunder Bay, located in north east Michigan, has long been revered as a sacred landscape to its local inhabitants. This was an area where the heavens met the earth. The region that encapsulates Alpena Twp. has been referred to as Thunder Bay for good reason. The first and most obvious is due to the wicked storms that grace the Lake Huron shoreline. 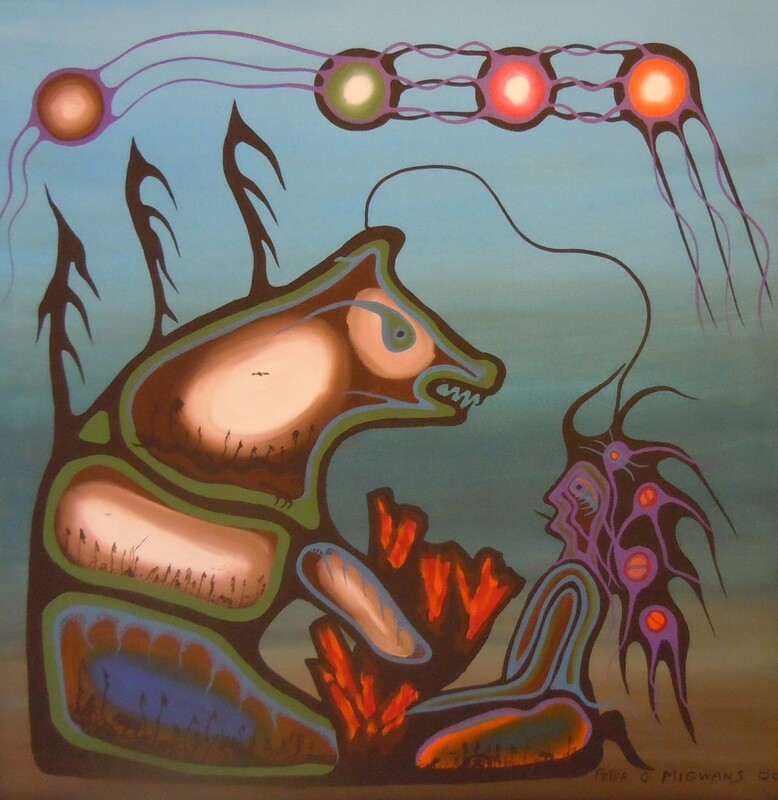 The second reason for this title (Thunder Bay) stems from Native American beliefs that this was the realm of the Thunderbird, as well as his arch enemy the Water-Panther! 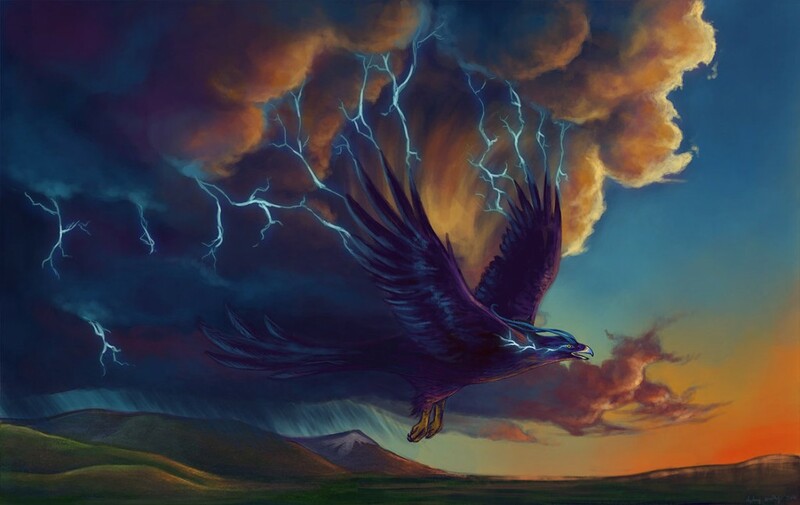 According to native beliefs not only was the Thunderbird or “Ah-ne-mi-ki” of Algonquin mythology related to the thunder & lightning, but also an absolute, imposing, all-powerful figure. 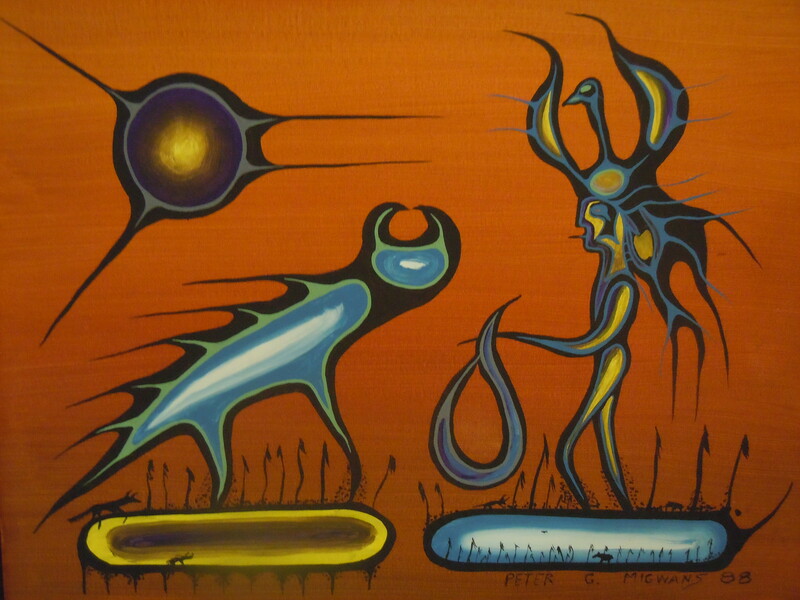 1 It was believed the Thunderbird could release devastating fire balls from his eyes into the Great Lakes disturbing his arch enemy the Water-Panther, “Mi-Shi-Pe-Shu”. These were Thunder Bay’s local mythological creatures who were believed to guard the regions upper-worlds, & lower-worlds. They were the Gate-keepers of the Great Lakes, a landscape where the heavens and earth converge. Before relating the amazing discovery, it is important to point out, The majority of the mystery disk collection now resides in Alpena Michigan. 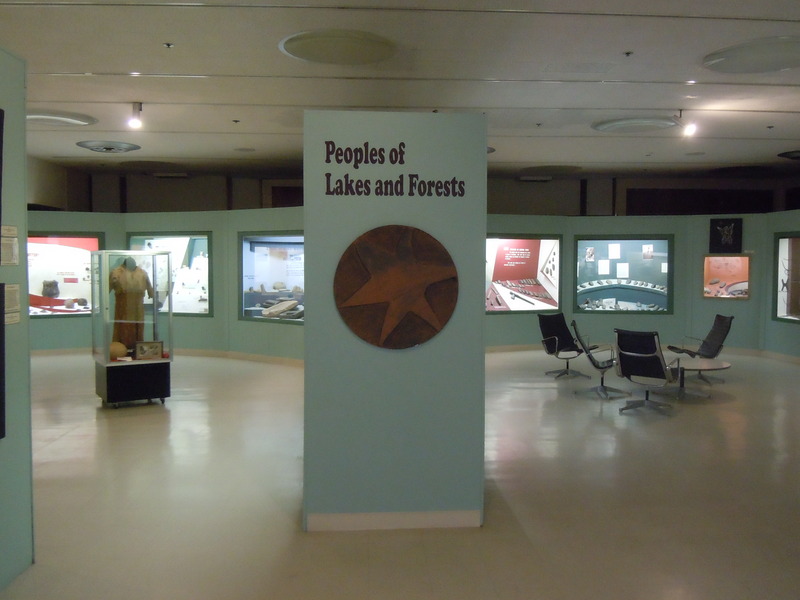 The Jessie Besser Museum contains an incredible “Peoples of Lakes & Forests” display in which the disks are now part of, and available for public viewing. The following description of the discovery comes directly from the display in the Besser Museum exhibit. 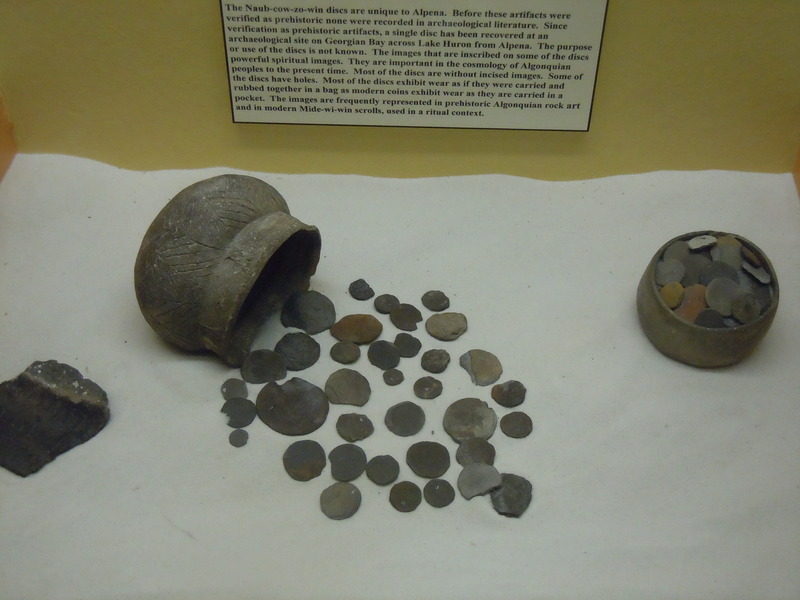 “Found in four locations in Alpena, most of the disks came from one location on an ancient Great Lakes sand beach. Collected by Mr. Gerald Haltiner in the late 1940’s and 1950’s. Mr. Haltiner recognized these artifacts as prehistoric. He requested the University of Michigan Museum of Natural History to authenticate the artifacts. The University anthropologists determined them to be recent manufacture and not prehistoric artifacts. 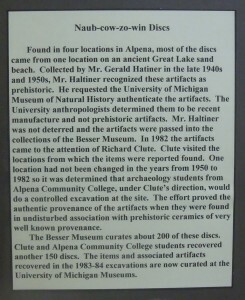 Mr. Haltiner was not deterred and the artifacts were passed into the collections of the Besser Museum. In 1982 the artifacts came to the attention of Richard Clute. Clute visited the locations from which the items were reported found. One location had not been changed in the years from 1950 to 1982 so it was determined that archeology students from Alpena Community College, under Clute’s directions, would do a controlled excavation at the site. 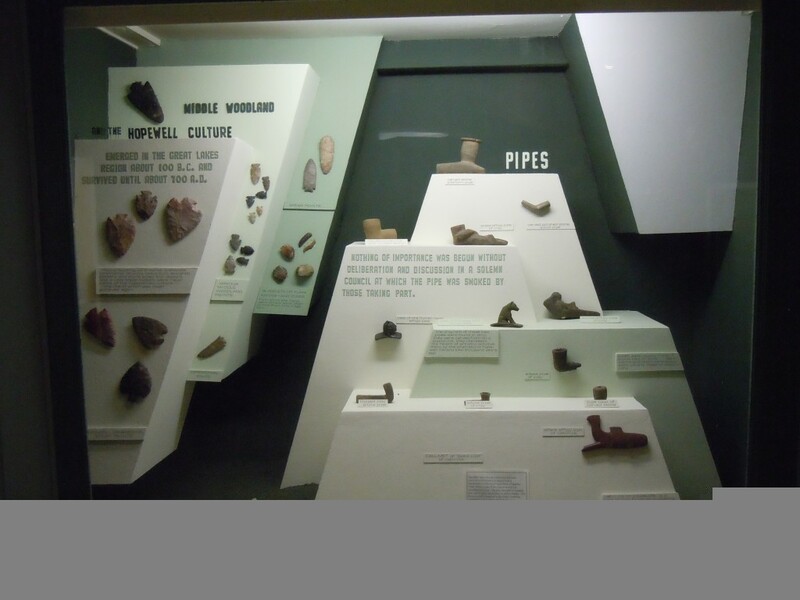 The effort proved the authentic provenance of the artifacts when they were found in undisturbed association with prehistoric ceramics of very well known provenance. This type of scenario in which the relics are initially claimed to be forgeries is unfortunately rather common. Luckily, in this instance the relics were investigated for a second time proving their legitimacy. 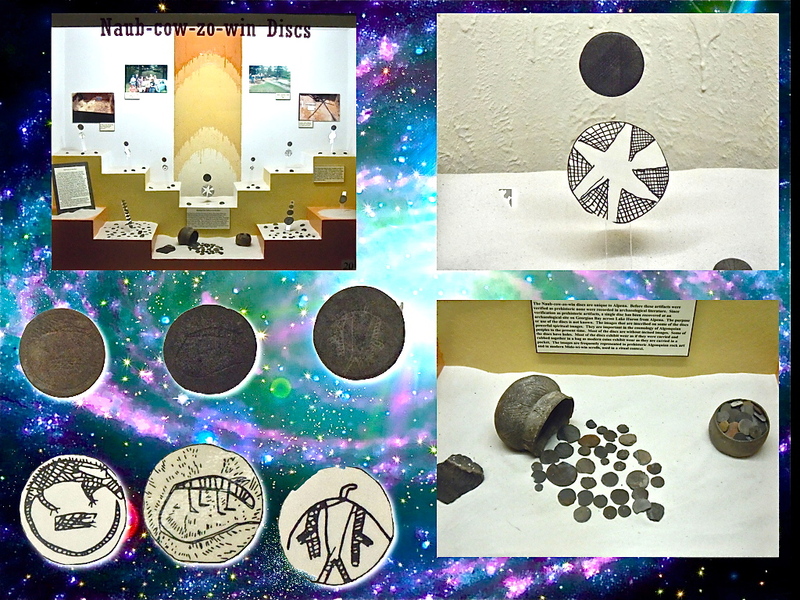 Now we know the relics have been authenticated, lets take a look at the symbolism the sacred disks incorporate. 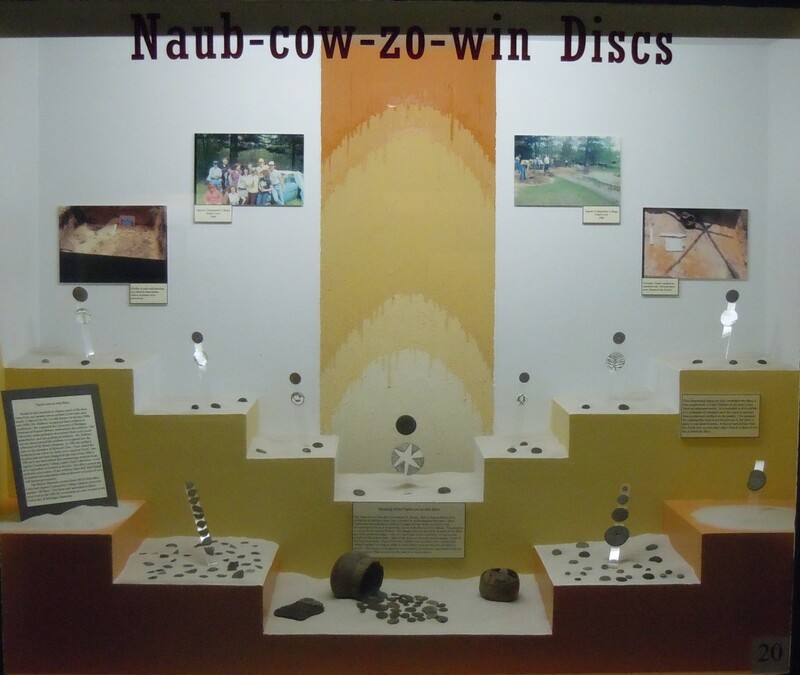 The sacred disks have been given the name “Naub-cow-zo-win”, which in the Ojibwa/Ottawa language means a charm of significance. 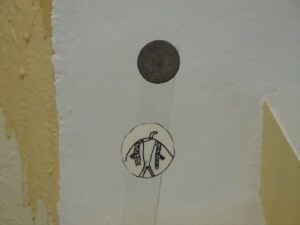 3 Some experts have compared the symbolism on the engraved disks to the “Midi’wi-win” birch bark scrolls of the ancient American Secret Indian Society. 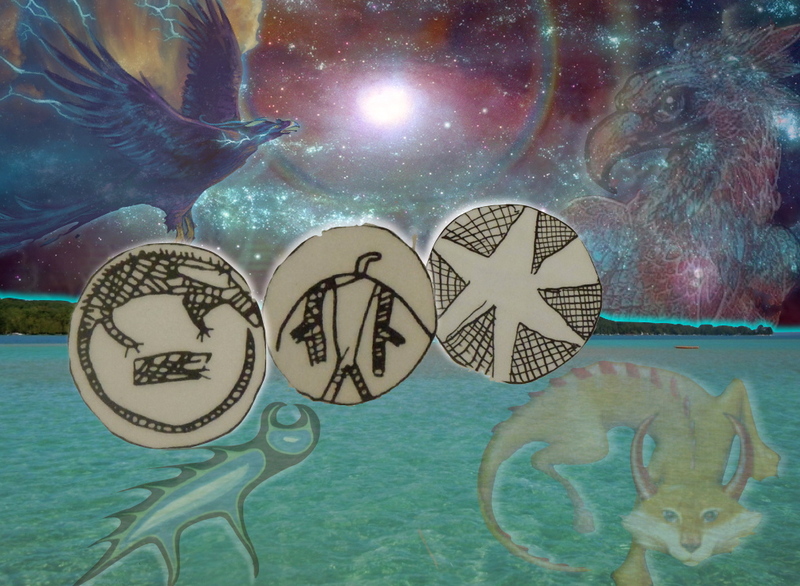 As mentioned previously, the majority of the disks contained symbols such as the Thunderbird, Water-Panther, Star Forms, and a Sacred Medicine Tree. While some of the disks had drilled holes through them, most likely so they could be worn by the natives, the sacred Thunderbird and Water-Panther did not. It is assumed this was the case due to the sacredness of these mythological creatures. 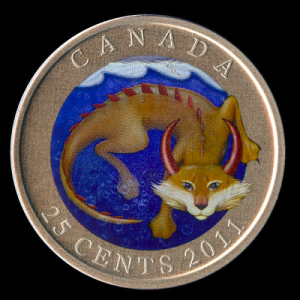 Robert Haltiner, one of the discoverers of the disk cache, points out in regards to the symbolism, “The long-tailed water lion appears 16 times, the otter on 5, our headless moose but once, while the Thunderbird represented 6 times, the beaver once. Furthermore, the drawing of the Medicine Tree occurs a whopping 19 times and the star is duplicated 4 times.” In some instances the sacred creatures were actually depicted headless! Now lets take a brief look at a few of the symbols individually. Mi-Shi-Pe-Shu’s name comes from the Algonquin/Ojibwa language meaning “Great Water-Lynx” or “Underwater-Panther”. 4 The mythological Mi-Shi-Pe-Shu is portrayed as an enormous aquatic feline with copper horns on his head, a dragon like body covered in scales, and a serpentine like tail tipped in copper. The creature was in some instances perceived as an aquatic feline, but in others as a more serpentine like creature. The shape-shifting Water-Panthers were believed to reside in the depths of the Great Lakes. Lake Superior was thought to be one of the monsters favorite stomping grounds, as the natives believed that Mi-Shi-Pe-Shu was the guardian and protector of the regions sacred copper mines, and copper. This is surely one reason why the creature is described having copper horns and a tail tipped in copper. This Underworld god was believed to live in the bottoms of lakes, rivers, and especially caves. When Mi-Shi-Pe-Shu surfaced, legend has it, the slashing about of his serpentine like tail could cause wicked storms, and on occasion even sink boats. Mi-Shi-Pe-Shu could be either a benevolent or malevolent being depending upon the scenario. Considering the creatures reign of the Great Lakes region, he was well known, feared, and especially respected. He was even revered as a “Manitou” or being worthy of worship. 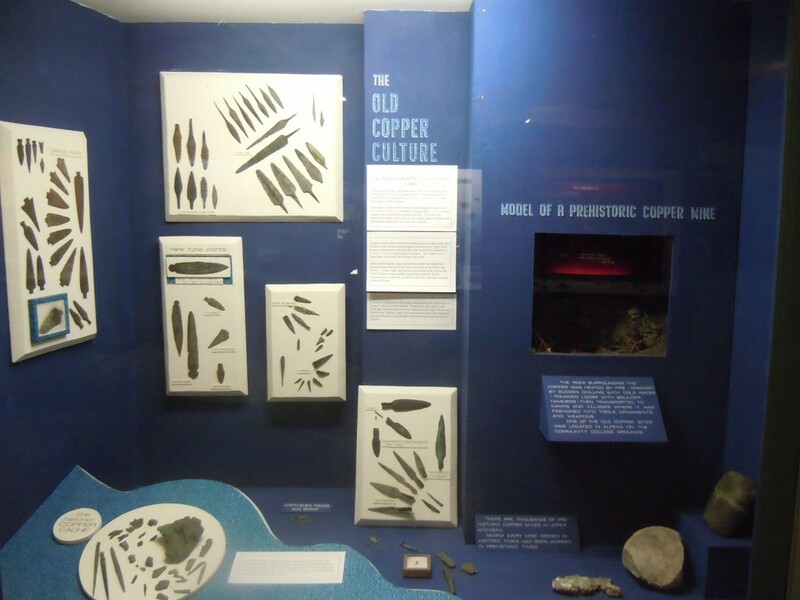 For this reason, when desiring to cross the regions lakes or steams, it was common practice to make a small offering of tobacco or even copper when at all possible. There are stories of people who did not heed this advice of making the Manitou a sacred offering. Lore has it Mi-Shi-Pe-Shu on occasion would create “whirlwinds” on the surface of the lakes through which the offenders would be swept away. 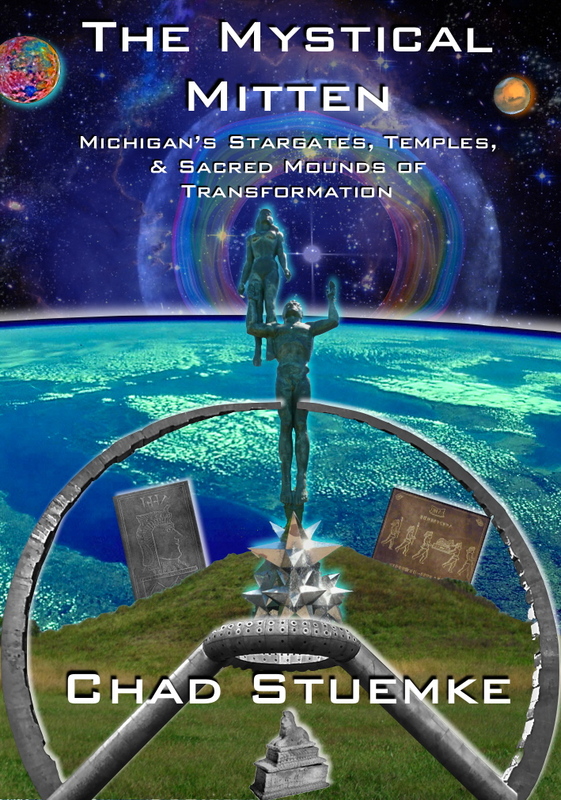 There were several sacred landscapes along the shores of the Great lakes in which ceremonies and even sacrifices were made to the almighty Mi-Shi-Pe-Shu. 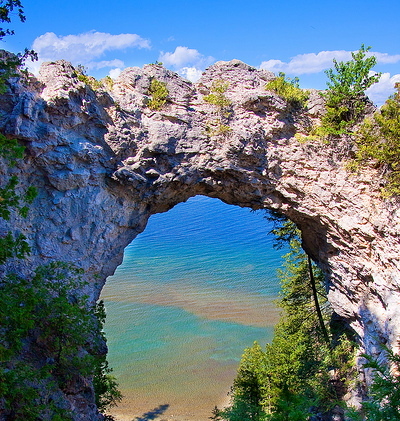 In Northern Michigan’s upper peninsula, along the Pictured Rocks shoreline, legend has it natives would sacrifice dogs from atop the sacred Portal Rock in hopes of appeasing the guardian & gate-keeper of the lakes. Lending its name to the Thunder Bay region was the legendary Thunderbird, arch enemy and in eternal conflict with Mi-Shi-Pe-Shu. Legends portray the Thunderbird as an enormous bird in which the flapping of his huge wings could cause thunder. In conjunction with the thunder it was said the Thunderbird could also shoot lightning from his eyes. The Thunderbirds were gods of the upper worlds, in contrast to the Water-Panthers, gods of the underworld. This is where the Thunderbird legend diverges. While in some instance the Thunderbird was considered strictly a mythological being, other times it was perceived as a literal giant bird that took on mythological qualities. Even more fascinating, in some cases the Thunderbirds were referred to as the “Thunders”. In this scenario the “Thunders” were part bird, part men… Bird-men! The following Algonquin legend about the Thunderbird & “Thunders” is entitled “An Indian Transformed Into A Thunder”. Once an Indian was whirled up by the roaring wind: he was taken up in a thunder-storm, and set down again in the village of the Thunders. 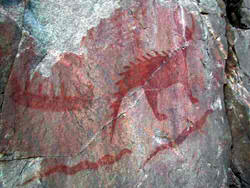 In after-times he described them as very like human beings: they used bows and arrows (tah-bokque), and had wings. But these wings can be laid aside, and kept for use. And from time to time their chief gives these Thunders orders to put them on, and tells them where to go. The great chief of the Thunders, bearing of the stranger’s arrival, sent for him, and received him very kindly, and told him that he would do well to become one of them. To which the man being willing, the chief soon after called all his people together to see the ceremony of thunderifying the Indian. Then they bade him go into a square thing, or box, and while in it he lost his senses and became a Thunder. Then they brought him a pair of wings, and he put them on. So he flew about like the rest of the Thunders; he became quite like them, and followed all their ways. 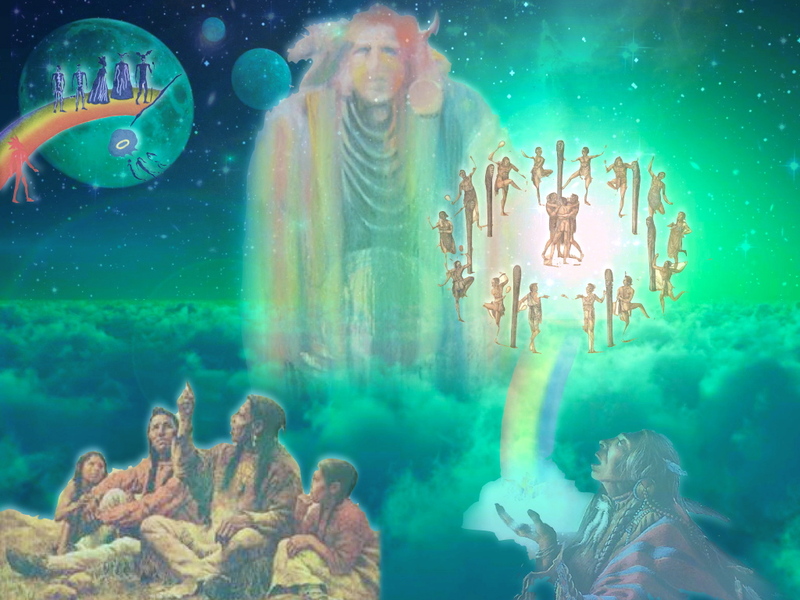 As mentioned previously, in conjunction with the Thunderbird and Water-Panther disks, there were many others portraying images of the sacred Medicine Tree. This was the Native American’s equivalent of the World Tree. 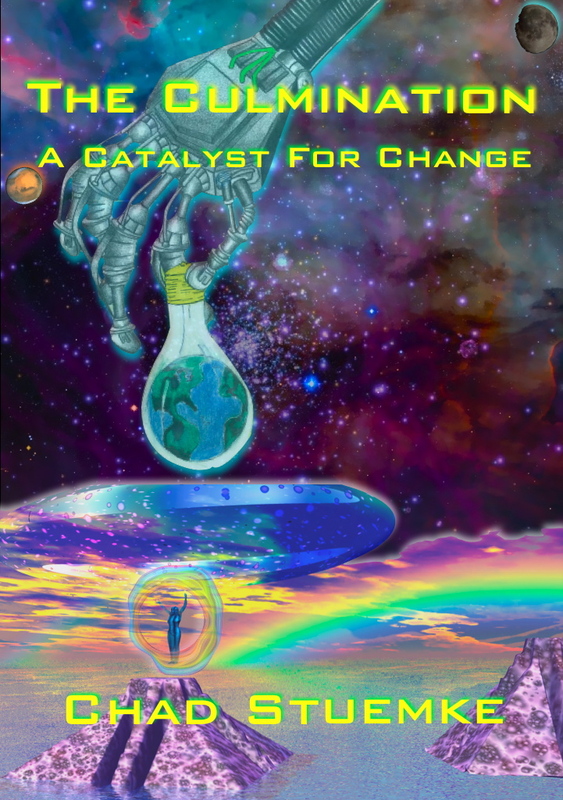 Symbolically the sacred tree created a heavenly axis, a cosmic connection point! As a cosmic tree the branches reach into the heavens, while the roots reach for the under worlds. The Sacred Tree was a way to connect with these other realms. Speaking of other worlds and the stars, let’s briefly investigate one final symbol, the Star! 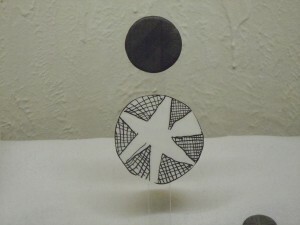 The Star disks in the Naub-cow-zo-win collection appears like a star hovering in front of a background filled with cross hatching. I personally perceive the cross hatching as a possible representation of space & time, especially considering the context of the entire collection. In regards to the Thunder Bay region, and its local inhabitants, how did they view the stars? First and foremost they considered the heavens (stars) to be their place of origin, home of their star ancestors, and dwelling place of the gods. Perhaps a few legends local to the area will help us to understand how the natives perceived the sacred stars. The bark lodges of an Ojibwa village clustered along the northern rim of Lake Huron. Here dwelt the tribal chief and his daughter, Red Wing. She was one of the loveliest of the ojibwa maidens and as good as she was beautiful. Her fingers were skillful at tanning skins into velvety softness. The quills of the porcupine she could weave into colorful designs. Baskets, too, she made, and she brought the rush leaves from the lake and wove them into mats. She gathered and dried the Indian corn and cooked it into savory dishes. The roots and seeds of the water lilly she prepared for eating. Much she knew about the lore of plants- what was good for food and what was good for medicine. The young men of the tribe were all in love with her and brought many presents to the door of her father. And though the chief looked with favor on several of the young braves, Red Wing kept her eyes to the ground and paid no heed to their soft words or glances. For, unknown to her father, Red Wing was already betrothed! So it came about that Red Wing gave no answer to the young men. Often she saw her Star Lover as she paddled on the lake, and the deeper grew their feeling for each other. The father of Red Wing was very angry. He spoke harshly to her and commanded that she forget about the son of the Evening Star. There could be no marriage between Spirit One and one who dwelt on Earth. Red Wing declared that she would not marry until the time came for her no longer to live on the Lake Huron shores. Here is the myth as told on the shores of Saginaw Bay, in Michigan, by Indians Cloud Catcher, a handsome youth of the Ojibways, offended his family by refusing to fast during the ceremony of his coming of age, and was put out of the paternal wigwam. It was so fine a night that the sky served him as well as a roof, and he had a boy’s confidence in his ability to make a living, and something of fame and fortune, maybe. He dropped upon a tuft of moss to plan for his future, and drowsily noted the rising of the moon, in which he seemed to see a face. On awaking he found that it was not day, yet the darkness was half dispelled by light that rayed from a figure near him—the form of a lovely woman. “Cloud Catcher, I have come for you,” she said. And as she turned away he felt impelled to rise and follow. But, instead of walking, she began to move into the air with the flight of an eagle, and, endowed with a new power, he too ascended beside her. The earth was dim and vast below, stars blazed as they drew near them, yet the radiance of the woman seemed to dull their glory. 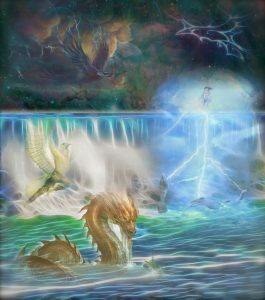 Presently they passed through a gate of clouds and stood on a beautiful plain, with crystal ponds and brooks watering noble trees and leagues of flowery meadow; birds of brightest colors darted here and there, singing like flutes; the very stones were agate, jasper, and chalcedony. An immense lodge stood on the plain, and within were embroideries and ornaments, couches of rich furs, pipes and arms cut from jasper and tipped with silver. While the young man was gazing around him with delight, the brother of his guide appeared and reproved her, advising her to send the young man back to earth at once, but, as she flatly refused to do so, he gave a pipe and bow and arrows to Cloud Catcher, as a token of his consent to their marriage, and wished them happiness, which, in fact, they had. This brother, who was commanding, tall, and so dazzling in his gold and silver ornaments that one could hardly look upon him, was abroad all day, while his sister was absent for a part of the night. He permitted Cloud Catcher to go with him on one of his daily walks, and as they crossed the lovely Sky Land they glanced down through open valley bottoms on the green earth below. The rapid pace they struck gave to Cloud Catcher an appetite and he asked if there were no game. “Patience,” counselled his companion. On arriving at a spot where a large hole had been broken through the sky they reclined on mats, and the tall man loosing one of his silver ornaments flung it into a group of children playing before a lodge. One of the little ones fell and was carried within, amid lamentations. Then the villagers left their sports and labors and looked up at the sky. The tall man cried, in a voice of thunder, “Offer a sacrifice and the child shall be well again.” A white dog was killed, roasted, and in a twinkling it shot up to the feet of Cloud Catcher, who, being empty, attacked it voraciously. Is it possible that some of these cosmic scenarios from the ancient legends could be brought into fruition in modern times? Could these legends be more than just myth & lore? Keep this possibility in mind as you read the following legend. Algon was a great hunter who found a strange circle cut in the prairie grass. Hiding in the bushes nearby, he watched to see what might have caused it. Finally, a great willow basket descended from the sky bearing twelve beautiful maidens. The maidens got out of the basket and began singing celestial songs and doing circle dances. All of the girls were beautiful, but the most beautiful of all was the youngest, with whom Algon was immediately smitten. When the girls in the basket next arrived, he and the other mice ran among the girls. The girls stomped on the mice killing all of them but Algon, who then resumed his human form and carried off his beloved. He took her to his village and in time she fell in love with him. They had a son and the three lived very happily for a time. But as the years passed, the sky- girl grew very homesick. She spent the entire day gazing up at the sky, thinking of her sisters and parents. This homesickness continued until she could no longer bear it. So she built a magic willow basket, placed her son and some gifts for her people in it, climbed in, and headed for the sky. She remained there for years. In her absence, Algon pined for his wife and son. Every day he went to sit in the magic circle, in the hope that they would return. He was now growing old. Meanwhile, in the far-off sky-country, his son was growing into manhood. The lad asked questions about his father, which made the sky-girl miss Algon. She and her son spoke to her father, the chief of the sky-people. He told them to go back to the Earth, but ordered them to return with Algon and the identifying feature of each of the Earth animals. Is it possible some of these legends are more than just myth and lore? This could be the case in regards to a crop circle that emerged in the fields in 2009. 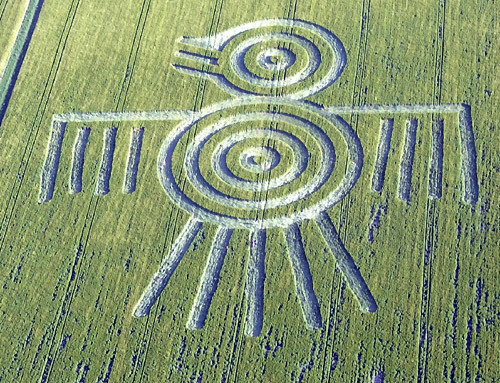 On June 14th 2009, a giant Thunderbird crop circle emerged near Barbury Castle near Wiltshire. Could it have been the “Celestial Maidens” in their “flying Willow baskets”??? Are ancient legends being brought into fruition in modern time? Makes a person wonder! Hundreds of ancient stone disks discovered within a landscape surrounded in myth and lore. A region named after the almighty Thunderbird, protector of the sky world, and Mi-Shi-Pe-Shu, guardian of the Great Lakes. This was an area where the heavens met the earth, and time and space converged. Although the incredible discovery of ancient disks were initially perceived by archeologist to be fakes or even forgeries, they now have been authenticated! These ancient, and one a kind relics help to preserve the cosmic myth and lore in which the ancients incorporated into their everyday lives. 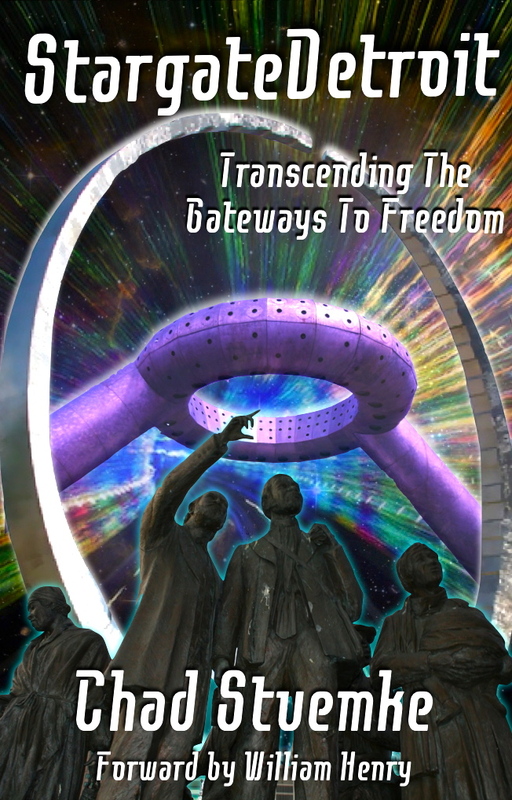 Now we to can appreciate the perceptions and beliefs of our long lost brothers and their Star Ancestors. 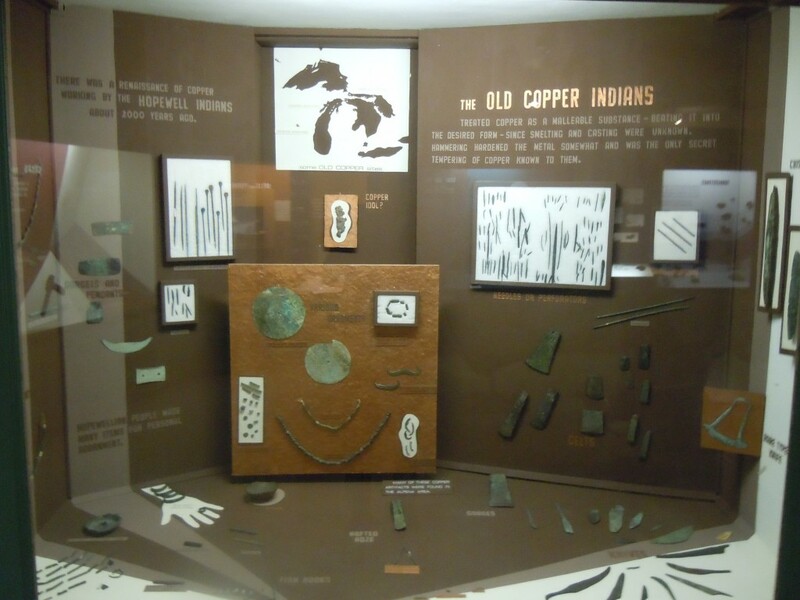 To see and experience the collection first hand: Besser Museum For North East Michigan, 491 Johnson St, Alpena, Michigan.